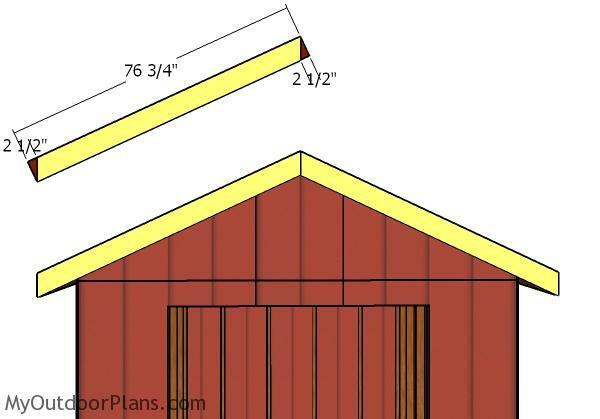 This step by step diy project is about 10×14 gable shed roof plans. 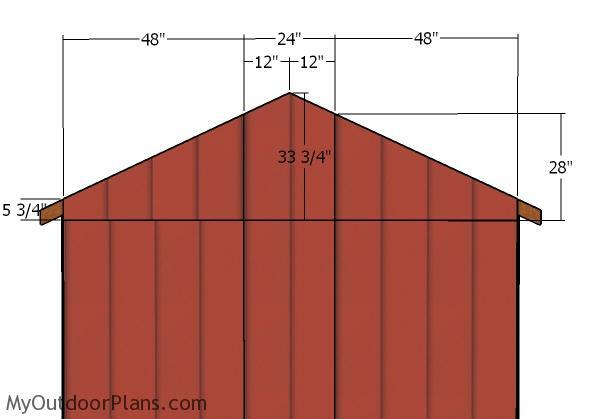 This is PART 2 of the gable shed project, where I show you how to build the gable roof for this shed. 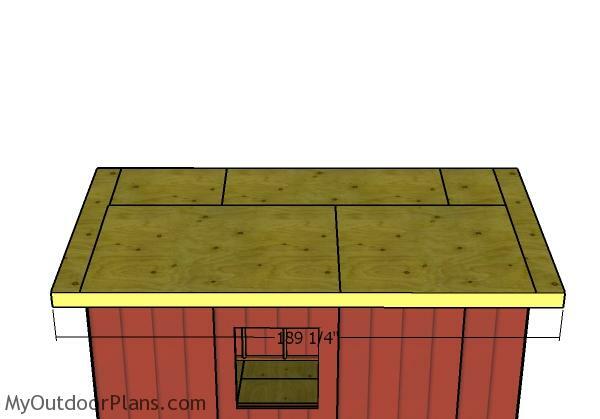 You can adjust the slope of the roof and the size of the overhangs, to suit your needs. Make sure you read the local codes so you can comply with the legal requirements. Take a look over the rest of my woodworking plans, if you want to get more building inspiration. The first step of the 10×14 shed project is to build the trusses for the shed. 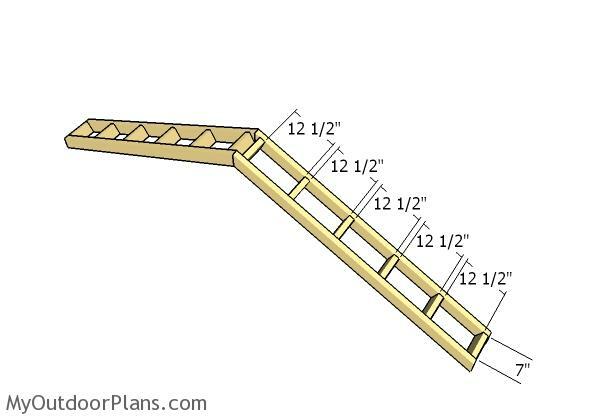 Make angle cuts to the rafters and use 2×4 lumber. Smooth the edges with attention and then lay them on a level surface. Leave no gaps between the rafters and align them with attention. Use 1/2″ plywood for the gussets. Mark the cut lines on the plywood sheet and then get the job done with a circular saw. Fit the gussets over the joints and then lock the gussets into place with 1 5/8″ screws. Fit the trusses to the top of the shed. 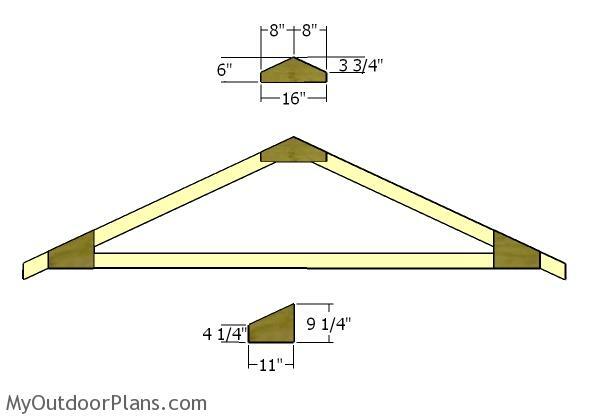 Place the trusses every 24″ on center for a professional result. Plumb the trusses with a spirit level and then lock them into place with rafter ties. 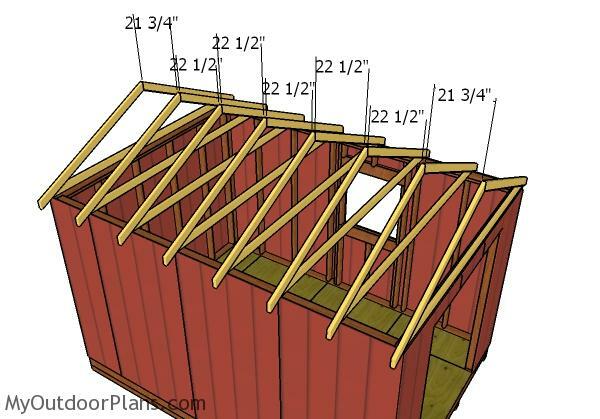 Use 2×4 lumber for the gable end supports. Drill pocket holes at both ends of the supports and then lock them to the trusses with 2 1/2″ screws. Leave no gaps between the components. 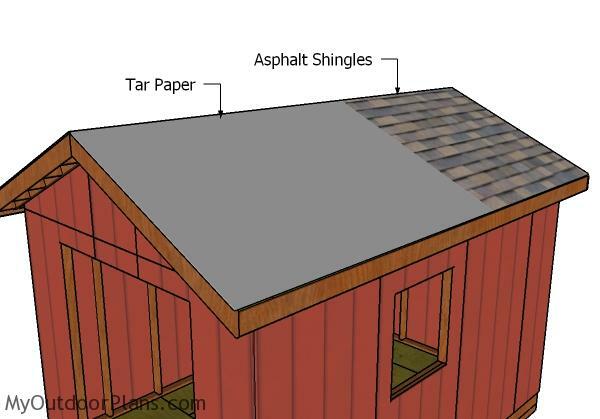 Use T1-11 siding for the gable ends. Mark the cut lines on the sheets and the get the job done with a circular saw. Smooth the edges and then lay them into place, leaving no gaps between the panels. Use 6-8d nails to lock the panels into place, every 8″ along the framing. 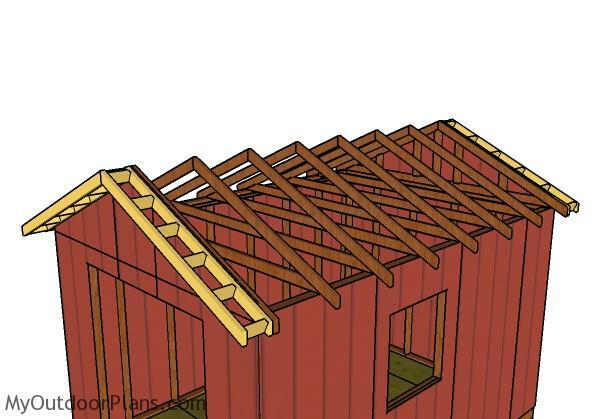 Assemble the overhangs from 2×4 rafters and from 2×4 blockings. Drill pilot holes through the rafters and insert 2 1/2″ screws into the blockings. Fit the blockings to the front and to the back of the shed. Align the edges flush, drill pilot holes and insert 3 1/2″ screws to lock them into place tightly. 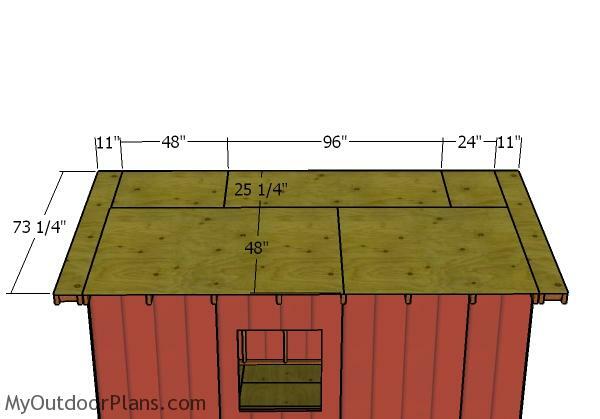 Cut the roof sheets from 3/4″ plywood and then lock them into place with 1 5/8″ screws. Align the edges flush and leave no gaps between them. Insert the screws every 8″ along the rafters. Fit the 1×6 trims to the sides of the roof. Align the edges flush and insert 2″ nails, to lock the trims into place tightly. Fit 1×6 trims to the front and to the back of the shed. Make 25 degree cuts to both ends of the trims and lock them into place tightly with 2″ nails. 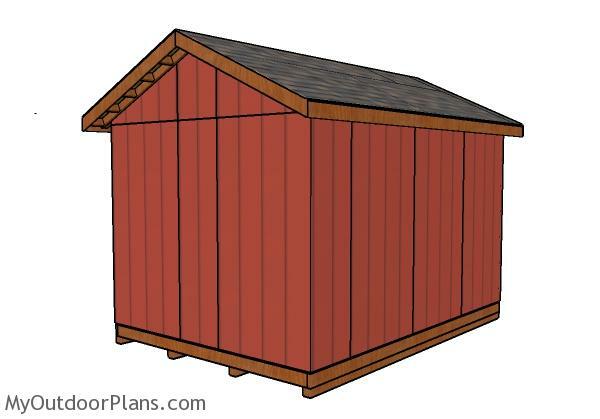 This shed is really sturdy but also very easy to build. 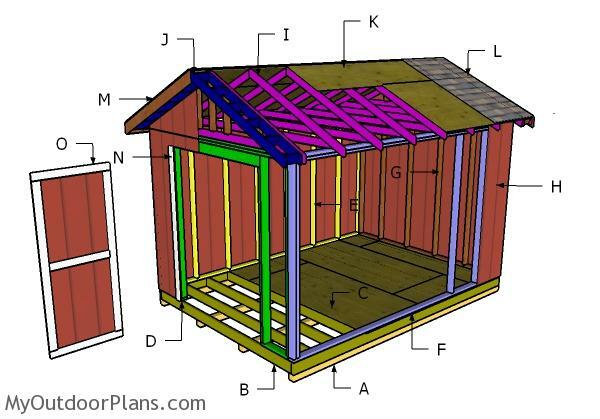 Make sure you check out PART 1 for the project to learn how to build the frame of the shed. Take a look over PART 3 of the shed, so you learn how to build the double front doors. This shed features double front doors for an easy access and a side window, so you have plenty of natural light inside. 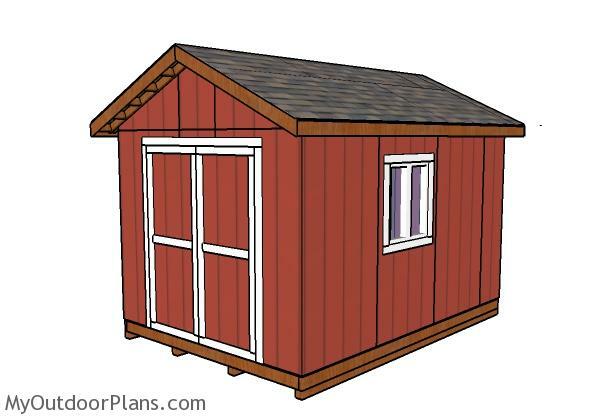 This woodworking project was about 10×14 gable shed plans free. If you want to see more outdoor plans, check out the rest of our step by step projects and follow the instructions to obtain a professional result. 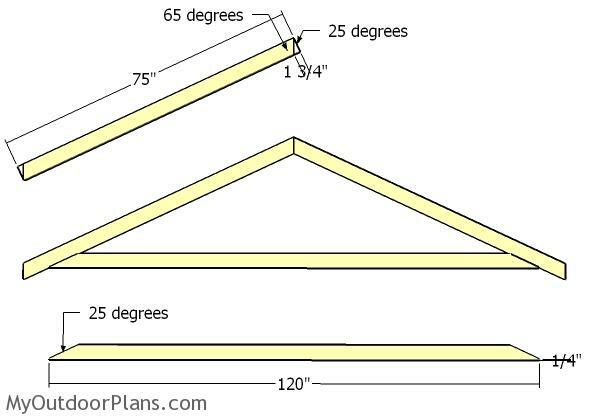 “Building the trusses” section: 120″ long 2×4 gets a 65 degree cut not a 25 degree. This had me scratching my head a while. 65 degrees is pointing at some dot…what is this?? I show you the angles of the rafters, after the cut. So you need to make a 25 degree cut to the rafters and a 65 degree cut to the bottom rafters. 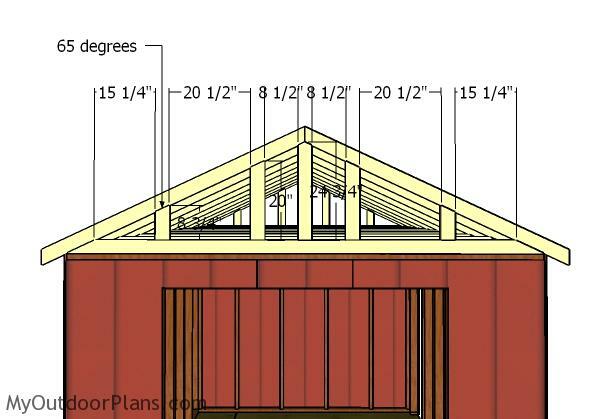 After making the cuts, you will have the following: the rafters will have a 65 degree end and the bottom rafters will have both ends at 25 degrees.